Summer vibes. Citrusy, cerulean loveliness combined with deft pattern usage from the genius ladies at MWM. The elements here are simple, friends...fabulous color and pattern can go a long way. Hoping to have a nice summer weekend filled with family and friends...hope you are as well. Have a great break...see you next week! 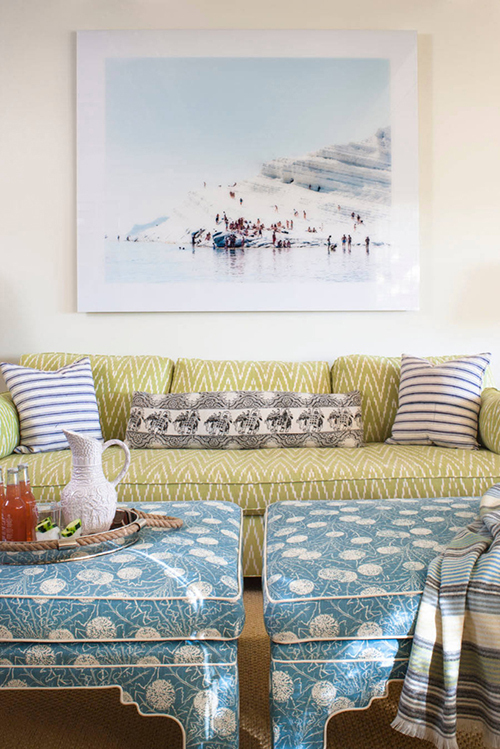 What's particularly genius about this 'layout' is how artfully the designer has picked up elements from the framed art: the blue patterned stools hinting of floating ice islands; the layers in the pillows and blanket echoing the sedimentary layers in the ice... so brilliant!